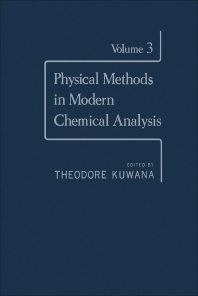 Physical Methods in Modern Chemical Analysis, Volume 3 presents the fundamental principles, the instrumentation or necessary equipment, and applications of selected physical methodologies in chemical analysis. This volume contains chapters that discuss various topics on chemical analysis methods such as transform methods in chemistry; X-ray spectrometry; the principles of electrochemical measurements; and global optimization strategy for gas-chromatographic separations. The book will prove to be an excellent reference material for chemists, researchers, and students of chemistry.